This is the Olight H2R headlamp sent for review by Olight , no other compensation other than keeping the light. The price of the H2R at the time of this review $89.95 with all the included accessories such as the included Olight cell (proprietary) , magnetic charger , clip , magnetic headband , padded adhesive strips and user manual. I know there are already several reviews out on this light but here is my take on it , complete with live video footage showing the H2R compared to the Olight X7 Marauder at the 3000 lumen setting in the main video……..
To my knowledge this is the most powerful headlamp produced to date with a rated 2300 lumens and to be such , it is a really compact light that uses the 18650 sized cell for power. This light is designed much like the H1R Nova headlamp and just a bigger version of that one basically with much more output. The light utilizes the XHP 50 emitter for all this power an that sits behind a nice TIR optic that gives a very smooth floody beam. 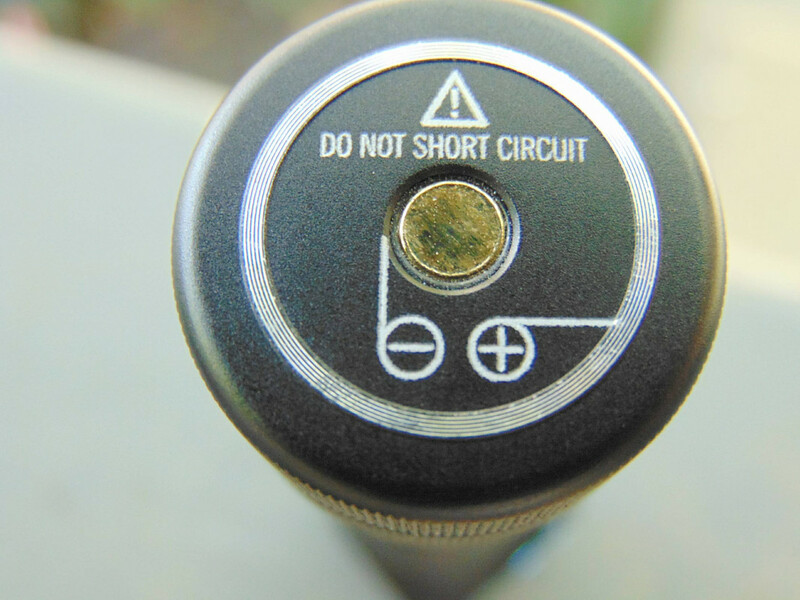 The H2R also has the Blue bezel ring and blue ring around the switch button that Olight has become so well known for. The light can also be used as a pocket carried light , head up or head down , with the Bi-directional clip that comes with it , as well as a work light or lamp using the magnetic tailcap , as it can be stuck to any metal surface. The charging can be done via the included charger , through the tailcap of the light , or the cell can be removed and charged as with any other cell on an external charger. I have used a couple non-proprietary cells in the light and they seem to perform well as long as you use a High drain cell with a button top , as the flat tops cells are not long enough. The output is amazing to me that this small headlamp can make the kind of brightness that it does when the turbo mode is used as everything within 60 to 80 yards of you becomes like daylight. 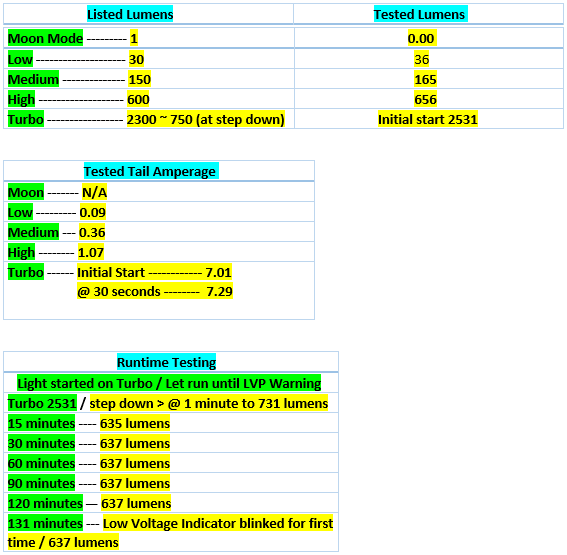 The modes other than the turbo are also well spaced with the High mode at just over 600 lumens , the Medium at around 160 to 170 lumens , the Low at around 35 lumens and then the Moonlight mode at about 0.5 lumen. Also for the amount of heat the H2R is making the light handles it decently as it is probably next to impossible to get a light this small to run cool with the amount of heat it makes. The UI is…….A long press to turn on in Moon Mode , a quick single press to turn the light on in the regular L/M/H , press and hold for about 1 second to change in regular modes , a double click to get into Turbo and a triple click to get into the SOS mode. The light also has mode memory and will come on in the L/M/H depending on the last used mode and also the moon or Turbo will memorize for up to 10 minutes , after that only the L/M/H will be in memory. There is also a maual lockout as well as the electronic lockout. The electronic is done by pressing and holding the switch button down until the light blinks and to get back out of the lockout you simply press and hold until the light blinks again. One other feature I wanted to mention is that the light holder on the headband is magnetic also so the light can be held in place by the magnet when you use the headband until the rubber strap is in place to hold the light firmly. The overall versatility , the build quality and the nice appearance , just makes this one a winner in my book with the new H2R headlamp. The rest should be covered in the video portion of the review. For those who don’t want to watch the whole video the still shots and beamshots start at 4:48 of the timeline and the live outside footage starts at 15:25 of the timeline. Unique Characteristics •Huge beam spill (TIR with diffuser lens)Smaller than a pinky finger. •Pocket light and headlamp in one with magnetic charging. Buy one light and get two! can normal 18650 battery use the charging utility? or must use Olight 18650 battery? The regular cells (re: Button top ….. LG He4 , Sanyo , Efest High drain) will work as far as the operation of the light. However Cells other than the proprietary cells will NOT charge inside the light itself and must be charged with an external charger. Permanent battery Voltage on charging contacts and magnet in tailcap – you are crazy? Olight sent me a new tail cap when I asked them I wasn’t sure if the tail cap on mine is the “safe” version. Can you tell from looking what cap you have? Any tells? If you are asking me I have the original style tailcap. It can be shorted if the Negative and Positive rings are touched with metal at the same time.